We often think of our Mormon foremothers as women who crossed the plains with babies strapped to their backs, or who made the desert blossom as a rose working alongside their sister wives. We know our history is full of strong and faithful women, certainly, but we might not be as well versed in their roles as suffragists (women in the Utah territory won the right to vote in 1870, which was earlier than anywhere else in the nation) and as physicians and midwives. In other words, Mormon feminist history is essentially as old as Mormon history. Mormon Feminism: Essential Writings, edited by Joanna Brooks, Rachel Hunt Steenblik and Hannah Wheelwright and published by Oxford University Press, delves deeply into the Mormon Feminism of the last fifty years-- spanning the time period from the fight over the Equal Rights Amendment to President Benson's "To the Mothers in Zion" talk to present-day concerns over expanding women's official roles in the LDS Church. In the last few months since Mormon Feminism: Essential Writings has been published, I've been delighted to see it on the shelves of bookstores all over Utah. This widespread availability of the book seems to reflect what Brooks as to say about the intended audience in her introduction: "This book is for anyone who wants to go deeper than the headlines and understand what it means to be a Mormon feminist. This book is for Mormon men and women who have questions about gender dynamics within Mormonism. Maybe you have wrestled about these questions personally. Maybe you have witnessed a friend or relative struggle with these questions, or have heard about Mormon feminist activism and want to understand it better. Maybe you are not Mormon but are curious about how contemporary Mormons live our vibrant and demanding faith and reconcile ourselves to its challenges. . . ."
The breadth of the intended audience is reflected in the wide range of authors included in Mormon Feminism: Essential Writings-- more than forty women. Voices include church leaders like Chieko Okazaki (former member of the General Relief Society Presidency), activists like Kate Kelly, bloggers like Lisa Butterworth (founder of Feminist Mormon Housewives), scholars like Laurel Thatcher Ulrich and Claudia Bushman, beloved poets like Carol Lynn Pearson, and many other women all across the spectrum of the Mormon experience. The collection also includes women of color and voices that extend beyond just American feminism. The editors of Mormon Feminism: Essential Writings should be praised not just for the breadth of their collection, but for the many extras that enhance the reading of the book. Brooks's introduction provides a nice overview to the history of Mormon feminism, especially in relation to mainstream feminist movements at work during the last fifty years. The editors do a nice job of scaffolding the pieces with introductions to the significant time periods, and with commentary and context on each piece included in the collection. I teach a Mormon Literature course, and this is a text I will definitely consider adding to my syllabus in the future, but I think it's accessible enough for a casual reader and would also be a fantastic book for book groups. The editors have added a fabulous Study Group Guide full of thoughtful discussion questions at the end of the book, ready made for book groups. They also list Selected Readings by Topic so readers can pick and choose what they want to read without delving into the book from beginning to end. I'm one of those people who likes to read a book from beginning to end, and this book was engaging and instructive for readers like me, too. While I felt fairly well-versed in Mormon feminism when I started reading, I felt that I learned a lot and view of people who can be included in the umbrella of a Mormon feminist was expanded and broadened. 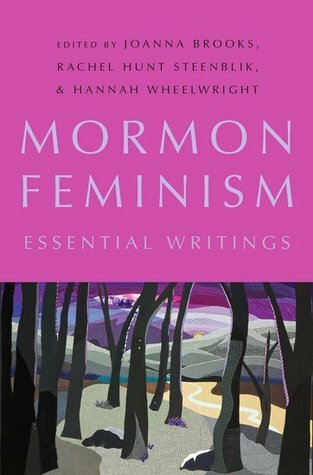 Reading Mormon Feminism: Essential Writings made me feel grateful for both the more recent foremothers who carry the feminist banner, as well as for the Mormon feminists with whom I brush shoulders from day to day. M. M. Banning sprung to fame in the 1970s when her only novel topped the bestseller charts. But the adulation was too much for Mimi, and she retreated to a mansion in Bel-Air, and never published another book. More than thirty years later, she's taken in by a Ponzi scheme and her publisher sends Alice to keep tabs on Mimi and help care for Frank, Mimi's nine-year-old son so Mimi can write another bestseller. 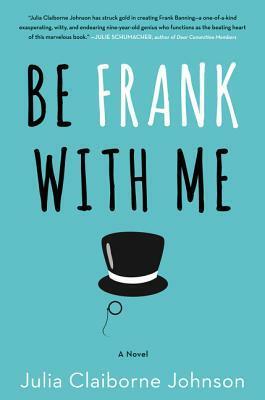 While Be Frank with Me is fascinating on many levels (who hasn't wondered what the rest of Harper Lee's life has been like, for example? ), it's Alice's relationship with Frank that is at the heart of the book. Although Frank is never labeled with anything, he seems to have Asperger's (he doesn't enjoy other kids, is obsessed with vintage clothes and old movies, doesn't sleep at night, and is comforted by tight pressure). While Mimi (who is unusual and difficult herself) adores Frank, she's also a little wary of him. But I loved watching Alice fall in love with Frank as the novel progressed. Also, there's a lovely twist at the end of the novel that is exactly the opposite of what I was expecting. Ove doesn't have anything left to live for. His dear wife, Sonia, died six months ago. He was just let go from the job he held for almost forty years. And he's always been grumpy by nature. He's just about to pull the plug on his life when the new neighbors, a young couple with two daughters, run their U-Haul into his mailbox. Over the next few weeks, Ove's suicide attempts are thwarted again and again as he makes friends, adopts a cat, saves a man from an oncoming train, and brings couples together, all against his will. 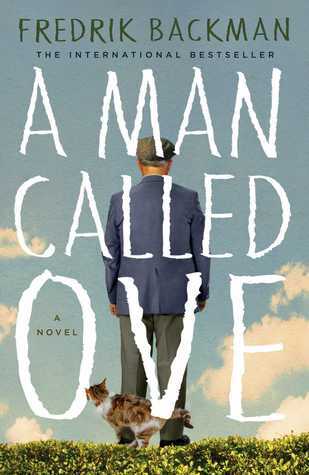 If you want a funny, feel-good book that isn't cheesy, A Man Called Ove might just be the book for you. Backman's Ove is so curmudgeonly that it's lovely to watch both his transformation and learn about his back story (in alternating chapters). Of course the book is a little Pollyannaish, but everyone needs a happy story from time to time. Besides, I've read so many dark and depressing Swedish books (hello Stieg Larsson) that it was really nice to read something light and Swedish for a change. 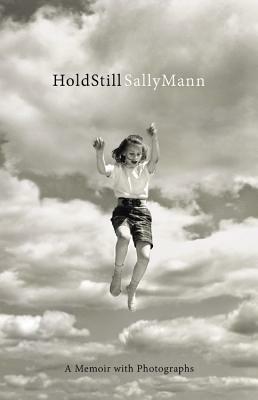 I didn't know anything about Sally Mann when I picked up Hold Still: A Memoir with Photographs, all I knew was that the book had been nominated for the National Book Award. I soon learned that Mann is a photographer who originally rose to fame in the 90s, when she published Immediate Family, a book of photographs of her children engaged in all of the intimate moments of growing up with children (sick, naked, vomiting-- she didn't shrink from capturing any of these moments. And the result is not Instagram but art. In Hold Still, Mann's story is all over the place-- she delves back into the distant past of her Southern relatives and the less distant past of the murder-suicide of her in-laws. She writes about racism and the long trip she took around the south with a photo lab in the back of her station wagon. Just like you'd expect from the subtitle, Hold Still is full of Mann's photographs. And when I looked at them, my initial response was not often positive. These are pictures that demand your attention. They're shadowed and often sort of spectral, and after looking at them for a while, I often grew to appreciate them. I felt the same way about the memoir. The narrative thread of the story isn't immediately apparent, but after reading the book for a while, you realize you're enjoying yourself so much you really don't care. It's a little weird, but it works. When Sadie Sparrow is placed on administrative leave from her police job (basically for becoming overly involved in the family of one of the cases she was investigating), she retreats to her newly-retired grandfather's home in Western England. Even though she's supposed to be relaxing and regrouping, her mind cannot rest, and soon she finds herself investigating the decades-old disappearance of a baby boy from an estate in town. She reaches out to Alice Edevane, the sister of the lost boy, who was sixteen when her brother disappears and is now a reclusive, cranky writer in her eighties. Alice and her sister have never talked about their brother's disappearance, and both always carried the weight of their own culpability. In The Lake House, Morton manages to marry the strains of guilt, responsibility and familial love of all kinds. The Lake House is a remarkable book. There are many books that I get to the end of and think, "I could have written that." 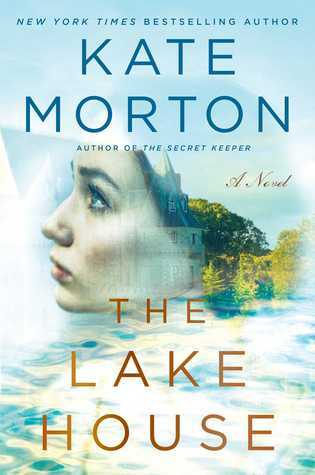 The Lake House has such a complicated story, and Morton manages to bring back tiny threads from early in the story that become prominent as everything comes to light. I was delighted to guess the mystery right with about 100 pages left to go, and even though some people might say that the way Morton ties together some of the threads are implausible, I prefer to see them as lovely and serendipitous. Content Alert: a pretty clean read. There are a handful of swear words, but don't let that hold you back from reading this beautiful book. When Paul Kalanthi was thirty-six, just a year from completing his training as a neurosurgeon, and just on the verge of finally achieving adulthood, he was diagnosed with stage-four lung cancer. 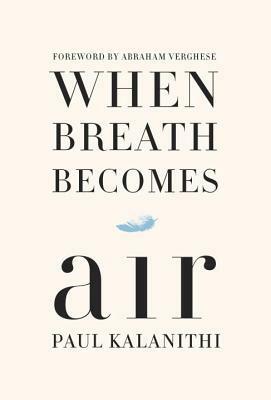 In When Breath Becomes Air, Kalanthi looks back on his life, especially on his training in medicine and literature, and how those two fields informed his approach to his disease, and, ultimately to his death. A few years ago, I read a short piece by Kalanthi published in The New York Times. If you've read this blog for a long time, you probably know that I love literature about medicine, and this piece, and this story, really hit home for me, because, like Ed and I a few years earlier, Kalanthi was poised at the beginning of a life he'd spent half a lifetime preparing for. It felt so unfair, and I really admired the poetry of his language and the pathos I felt while reading. When Breath Becomes Air manages to retain the beauty in the language of that shorter piece, while providing a more extended meditation of life. This is a fabulous book for any reader, whether confronting your mortality or not. At a time in a dystopian near future, the Earth has fallen to ruin. Like many of their peers, Charmaine and Stan, who formerly had steady jobs (she had a college degree and worked in a nursing home), now live in their car, surviving on donuts, never knowing when their next shower will be. When they learn about Consilience, a utopian development, their desire for stability overrides any concern they might have about the place, even though part of the condition of living there is that they voluntarily surrender themselves to a prison every other month. Soon they find themselves involved in all sorts of entanglements (romantic and more nefarious), until they wonder if life on the inside is all it's cracked up to be. 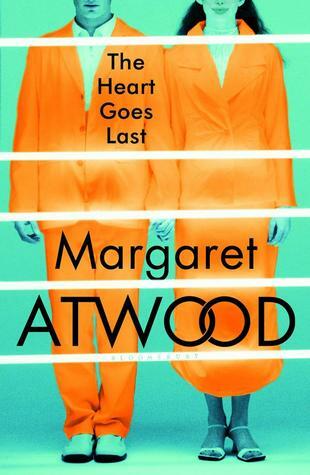 Before I read The Heart Goes Last, I would have told you that I loved Atwood's realistic fiction (The Blind Assassin is one of my all-time favorite books), but was less a fan of her speculative fiction (yes, I appreciated The Handmaid's Tale, and I think it is one of the best book club/literature seminar books because it's so much fun to discuss, but it's not where I'd naturally gravitate). This book is dark, funny, and profoundly weird. It's also really memorable. While the experience reading it wasn't as enjoyable for me as some of Atwood's other novels, I'm still glad I read it, and would love the chance to talk with other people about Atwood's purposes for creating this story. 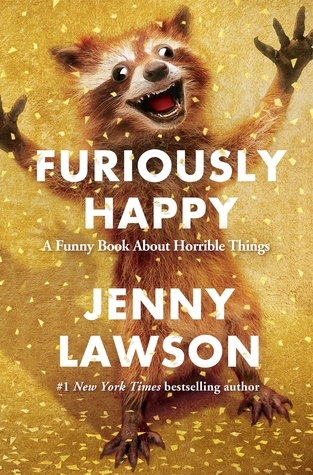 In Furiously Happy, Jenny Lawson, aka The Bloggess, writes frankly about her mental health challenges, which include anxiety, depression, and a host of related issues. Okay, okay, I know I'm going to draw some ire here, so I'm taking a deep breath and forging ahead. I'm not a regular reader of Lawson's blog. I never read her first memoir, Let's Pretend This Never Happened. I have never had some of the mental health problems that Lawson has had. So I'm not her target audience. But this book kept coming up in every "Recommended for You" feed, and I bought it. I was reading Brene Brown's Daring Greatly at the same time, and in that book, Brown talks about vulnerability and about how sharing too much too soon with people whose trust you haven't earned can backfire. And that's exactly what this book was for me. I think that for some people, those with whom Lawson has established a rapport over years, this book would be fabulous, but for me, it felt like too much, too soon. The details of all of her fights with her husband, Victor, the incredibly detailed conversations she had with herself, which are things her regular readers would probably love, just annoyed me. So this book would be fabulous in the right hands, but her willingness to put everything out on the table was too much too soon for this reader. Like many of you, my Instagram feed is full of lives that look much prettier than mine. They eat better food, their counters never have any crumbs on them, and there's no clutter anywhere in their homes. For the most part, these are people who make their careers in social media, so most of the time, I'm able to remember that the rest of their house probably doesn't look perfect, and I'm able not to hate them. One of the people I follow most eagerly is stylist/interior designer Emily Henderson, whose rooms always look effortlessly cool. So when I discovered that she had a new book coming out, Styled, I bought it right away. In Styled Henderson focuses not so much on the big pieces in a room, but more about how to accessorize a room. It reminds me a lot, actually, of a clothing stylist picking out jewelry. And while I'm not much of a jewelry kind of girl, now that Rose and Eli aren't in danger of breaking any accessory in the house, I figured it might be time to get some advice on how to move away from minimalism. There are some parts of the book (like the "what's your style" quiz) that seemed kind of pointless, but the book was mostly useful. 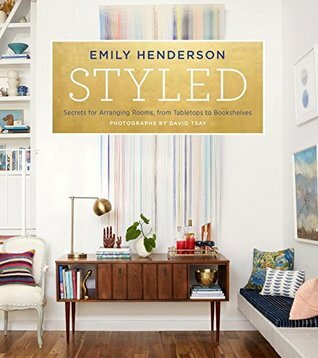 There are lots of pictures of Henderson's own home (which I love, from a purely voyeuristic point of view) as well as photos of projects she's worked on, and she talks about how to decorate shelves and tabletops so they reflect your own personal style. After reading the book, I took about 600 books to Savers and cleared out enough shelf space to do some styling of my own. It was a pretty fun experience, and I feel like the pointers she gave are good, if you are eager to increase your knicknack count.